Join PLDT TELPAD’s Bloggers Challenge for a chance to win a Macbook Pro and more! Calling all Philippine-based bloggers! Do you want to win a 13-inch MacBook Pro? Here’s your chance to get one for free! How? Simply join the PLDT Telpad’s Blogger Challenge! Participating bloggers must log on to http://telpad.pldthome.com/bloggerspromo.aspx to join the challenge. Fill out the registration form (name, blog URL, address, contact number, e-mail address), upload a headshot photo, and write their blog post about their Telpad story with 1 of their 1,001 reasons why they should upgrade their landline to a PLDT Telpad. After filling out, click “submit”. Bloggers must state in their post that readers who vote and sign up for a Telpad upgrade online will get a 16g Micro SD card as an incentive. Bloggers will be in-charge of promoting their own respective blog posts to get as many votes as they can until the end of the challenge. Hungry for more details? 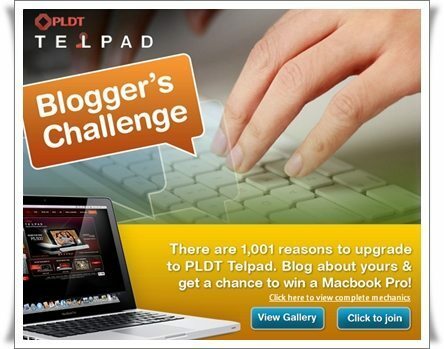 Visit the PLDT Telpad’s Blogger Challenge website! That MacBook Pro is waiting for you. Write your blog post now! *This promo is open only to Philippine-based Bloggers. Promo period runs from August 30, 2012 until October 31, 2012. Determination of winners is on November 15, 2012.
hi sis! thanks for sharing your entry! Good luck!